We went with some friends who are being transferred to Singapore to the Inn at Little Washington a couple of weeks ago. 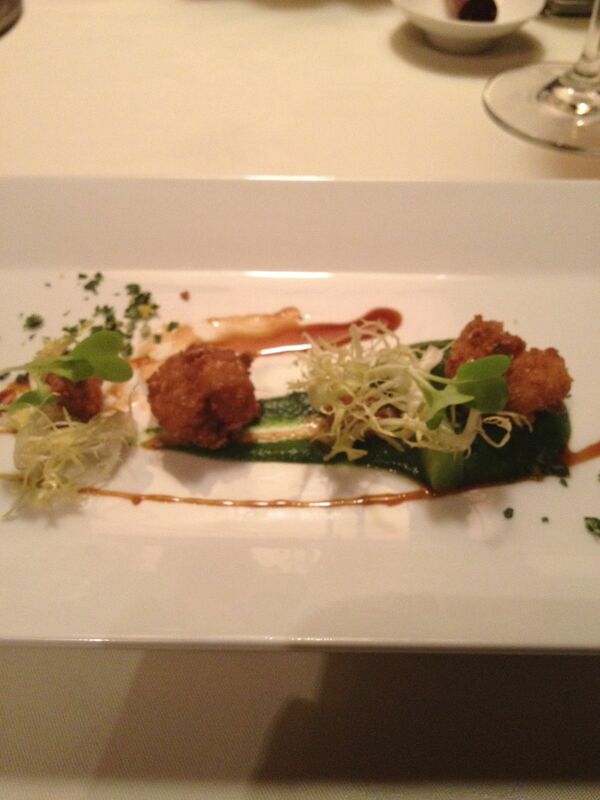 We opted to select the Gastronaut’s Menu, the tasting menu being offered. This time of year is a tough time for restaurants using local ingredients, as summer is drawing to an end but the fall produce isn’t quite fully harvested yet. 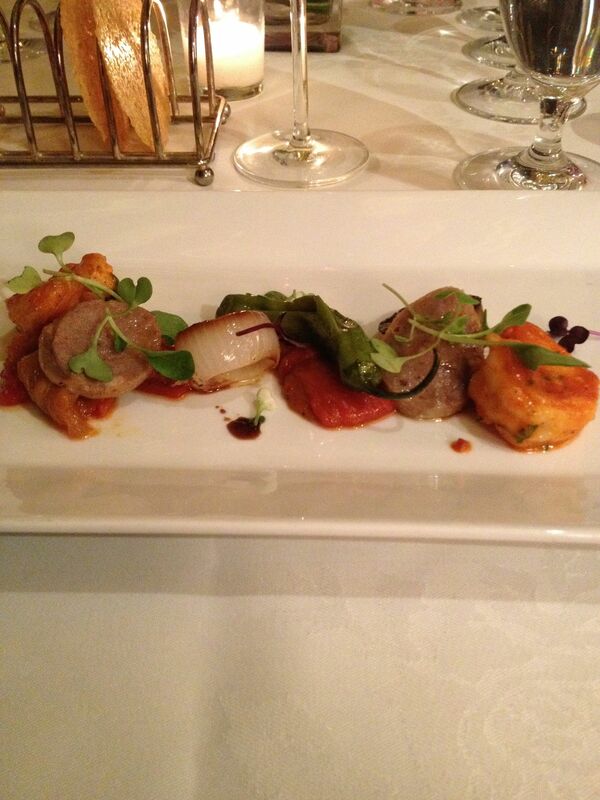 Not surprisingly, the Inn managed to combine the best of both and create yet another stunning meal. We started off with truffle popcorn and Parmesan tuiles. Honestly, I could eat vats of truffle popcorn and call it one of the finest meals I’ve ever had. It’s very addicting. 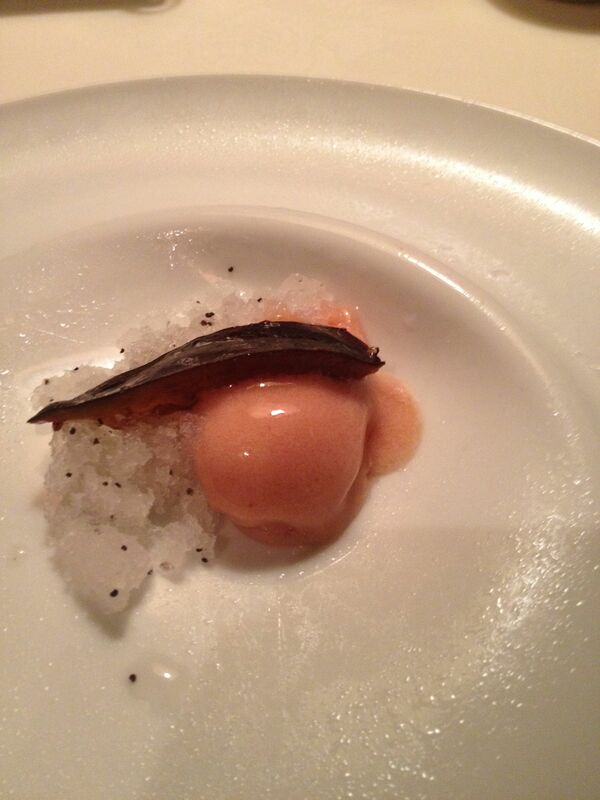 The first official course was eggs in an egg on an egg. 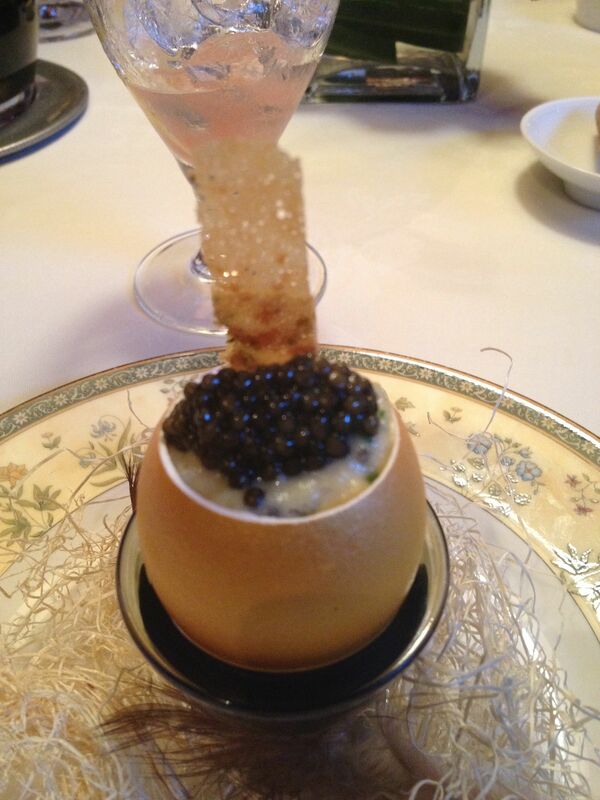 It consisted of Osetra caviar on top of scrambled eggs in a ¾ eggshell. Simply delightful. 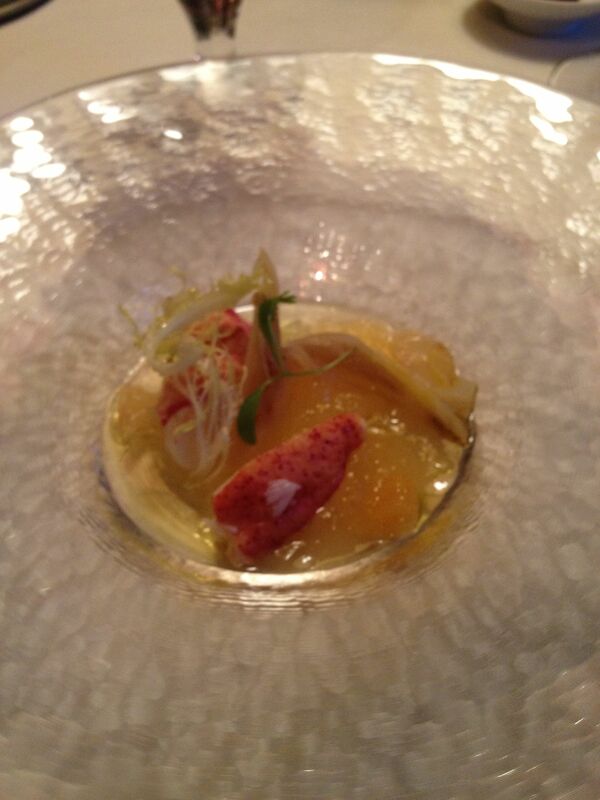 The next course was poached Maine lobster with citrus jelly. The citrus jelly was just acidic enough to counteract the richness of the lobster but not so sour as to detract from the shellfish. Yum! Next up was chicken fried frog legs. I actually would really like frog legs, if I could get over the fact that they were frog legs. The meat is rich and flavorful (tastes like (dark meat) chicken! ), but we’re still talking an amphibian. They were delicious if you could get yourself mentally past what you were eating. 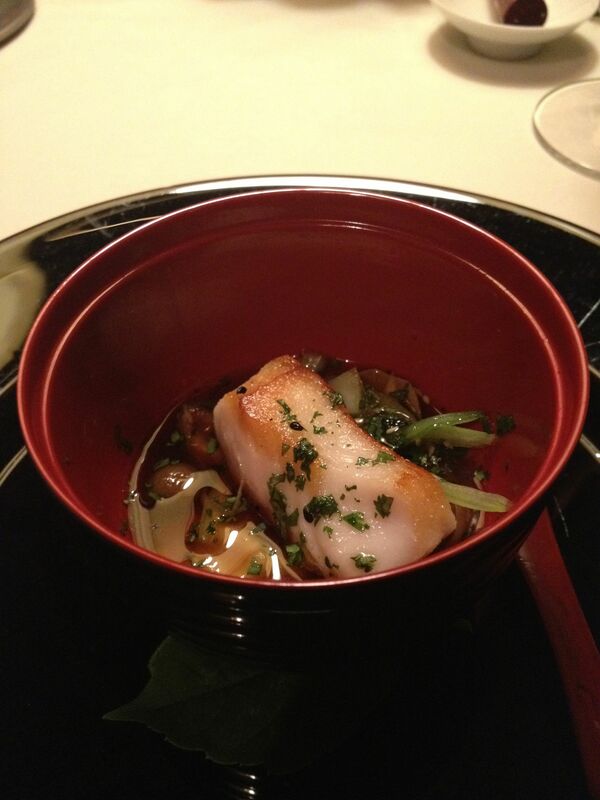 One of the best dishes of the menu was next—the Asian infused black cod. The cod had been marinated in miso, and it was perfectly cooked—by which I mean that it was cooked all the way through but so delicately that the fish flaked off with a fork. It was amazing! Pappardelle pasta with mushrooms and Virginia ham was next. 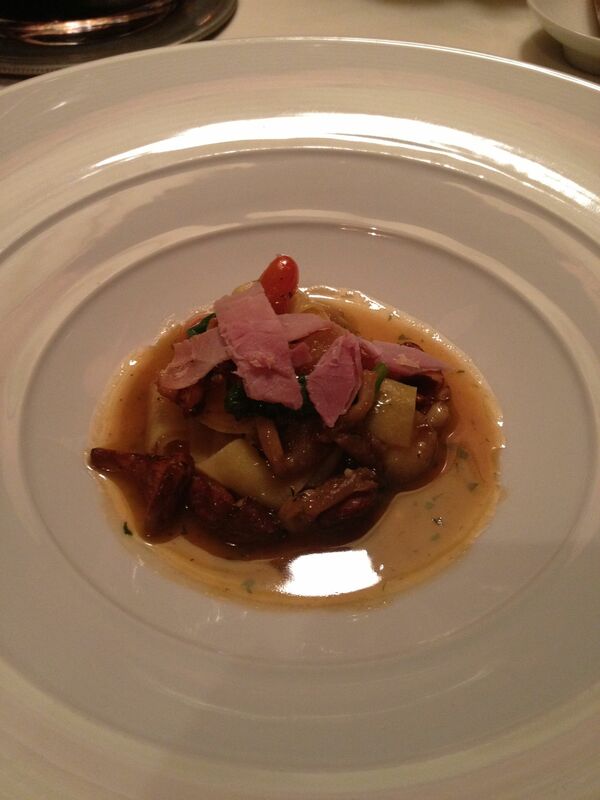 The mushrooms and the ham gave the dish a “meaty” texture, even though there was not an overwhelming amount of meat. It was a perfect introduction to the beginning of fall. 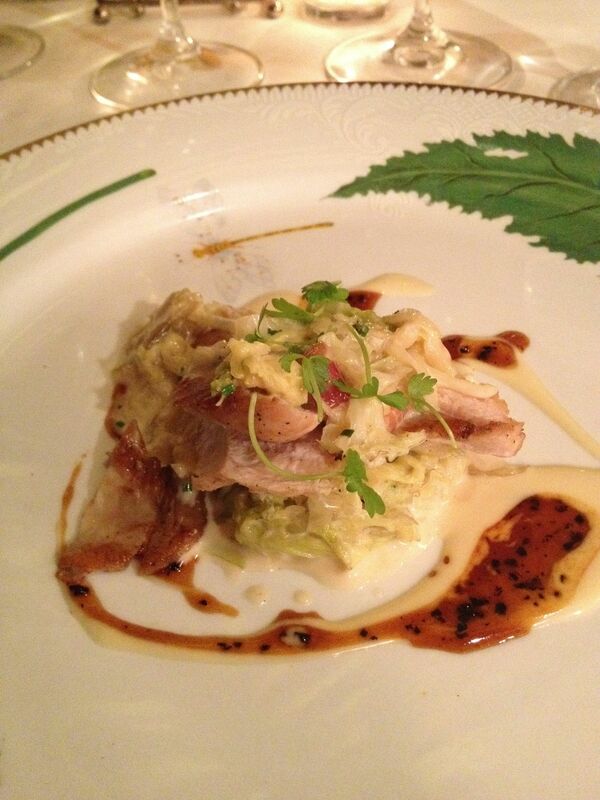 The final main course was duck served with fig au jus. 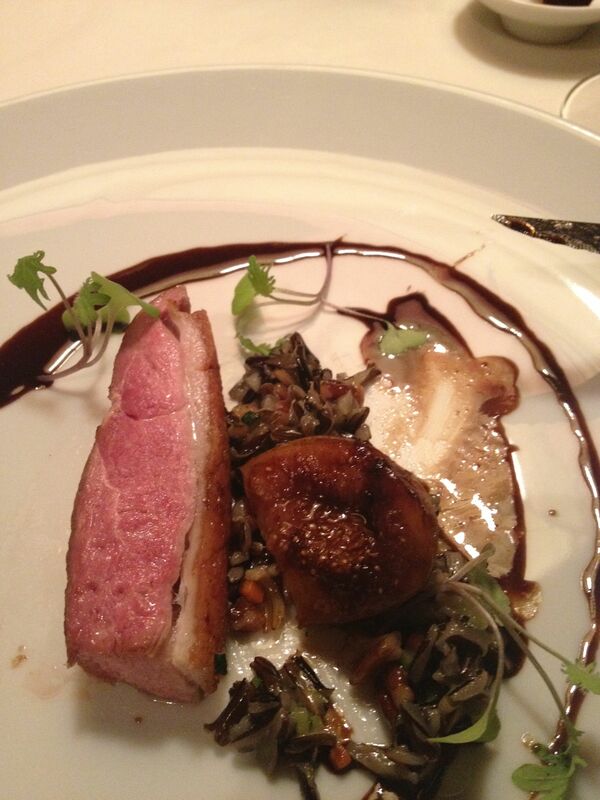 I love duck, so this dish ranked among my favorites that night. But even Jim, who is not nearly as fond of duck as I am, thought this dish stood out. The duck was slightly smoky and the fig sauce counterbalanced the heartiness of the duck nicely while not being cloyingly sweet. It was an outstanding dish. The palate cleanser was plum sorbet served with a slice of plum on top. The sorbet made it seem like summer while the plum flavor is definitely a late summer/early fall taste. 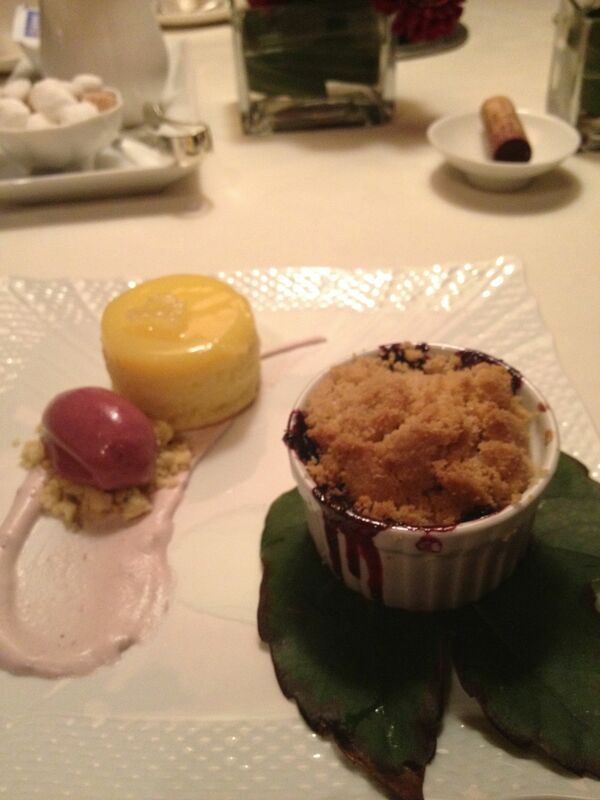 Dessert was blueberry cobbler and lemon pudding cake served alongside a cherry sorbet. The blueberry cobbler was just the perfect balance of sweet and tart while the lemon pudding cake was divine with its zesty citrus taste combined with the delicate but rich cake. Another fabulous meal by the Inn! We introduced some good friends to one of our favorite restaurants, the Inn at Little Washington on Saturday night. The Inn is located in Washington, Virginia, about an hour and 15 minutes from our house. It was a beautiful afternoon to drive out to the Inn (sunny and in the 50s), and we were warmly welcomed by the staff when we arrived. After some deliberation, we opted for the tasting menu (called The Gastronaut’s Menu) with its accompanying paired wines. 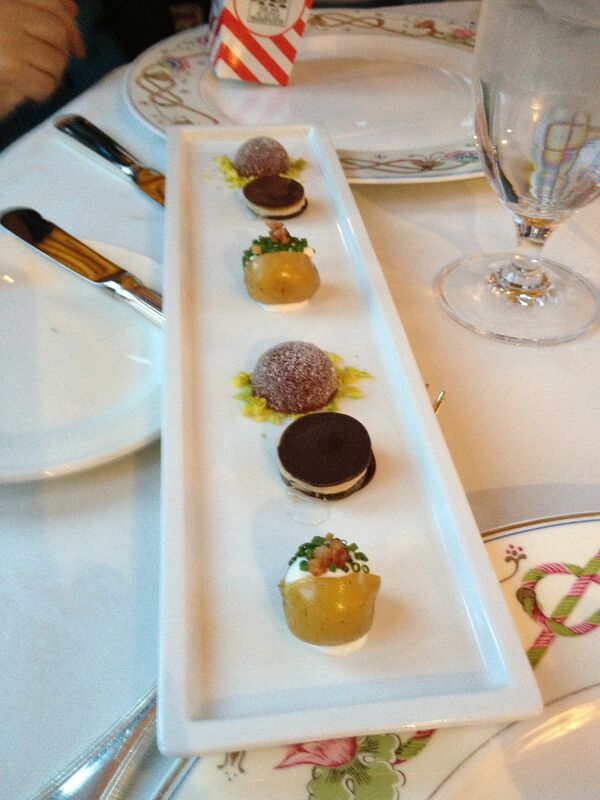 We started off with some pre-meal goodies–parmesan tulles and black truffle dusted popcorn (a personal favorite!). We also were served some delicious amuse bouches—the world’s smallest baked potato, a Valrhona chocolate sandwich filled with foie gras, and a bloody mary gelée. 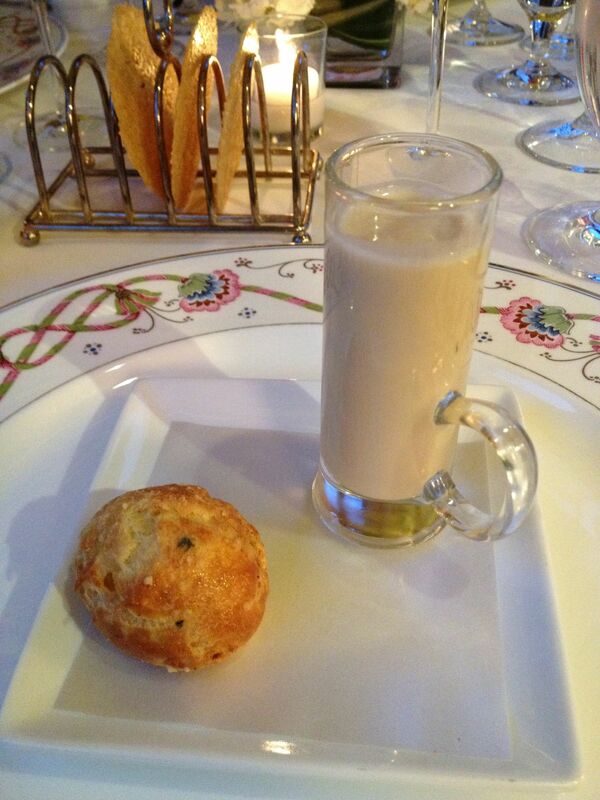 The introductory courses ended with a shot of white bean soup and a puffed cheese pastry. Next came a quartet of Rappahannock River “Barcat” Oyster Slurpees. 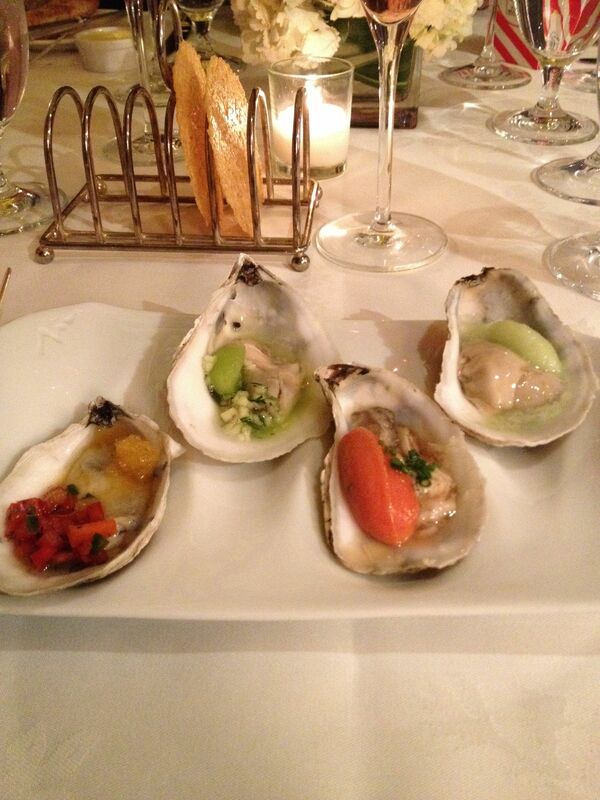 From left to right, they came accompanied with a small scoop of tomato sorbet, cucumber sorbet, cocktail sauce sorbet, and wasabi sorbet. The wine served with this course was a Veuve Fourny et Fils, Brut Rosé, Vertus, 1er Cru Champagne. The next course (and one of our favorites) was a Pan Seared Gulf Shrimp with House Made Sweet Chorizo and Shishito Peppers on Charred Onions. 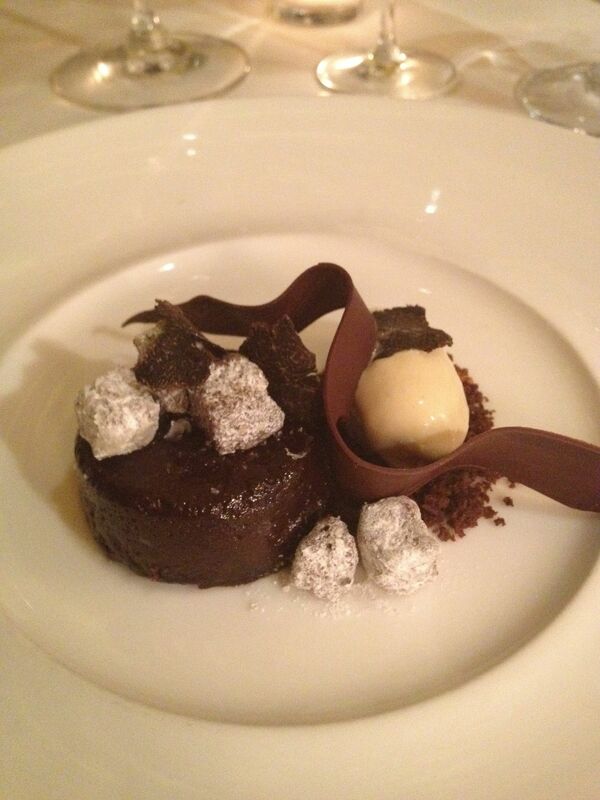 The paired wine for this course was a 2009 Quinta de Sant’Ana, Fernão Pires, Mafra from Lisboa, Portugal. 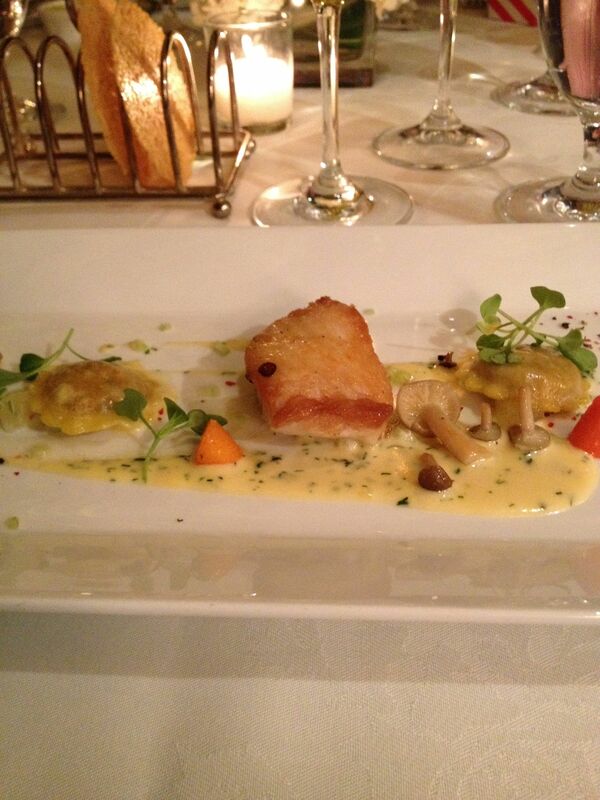 Another favorite was the Miniature Filet of Cod Sauté with Lemon Vodka Sauce and Lilliputian Shrimp Dumplings, which was served with a 2007 Verget, Les Clous, Meursault from Burgundy, France. 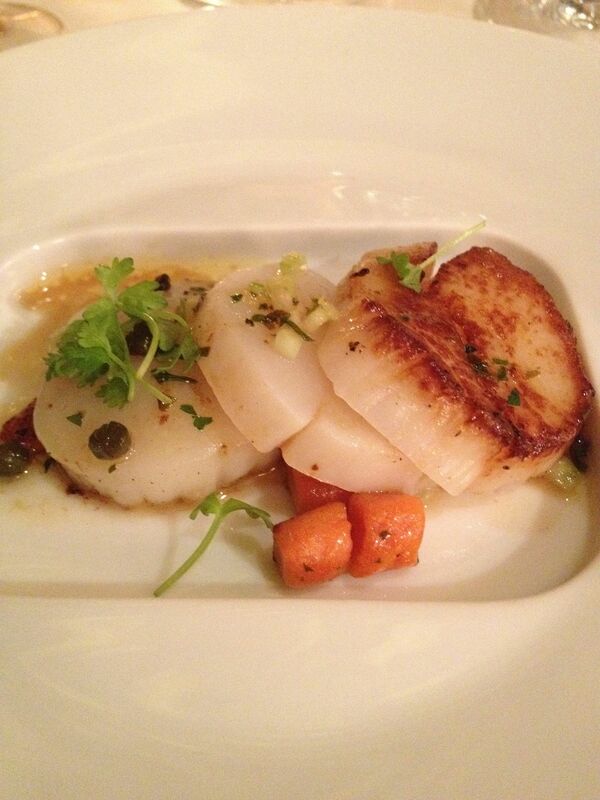 Then came the Maine Day Boat Scallop Sautéed with Tomato Gnocchi, Capers, Brown Butter, and Lemon accompanied by a glass of 2006 Marc Sorrel, Les Rocoules, Hermitage Blanc from the Rhône Valley in France. I am generally not a fan of white wine, but this wine had a lot of tannin in it and was very rich and dense—much more like a red wine than a typical white, which is probably why it was my favorite white wine of the evening. 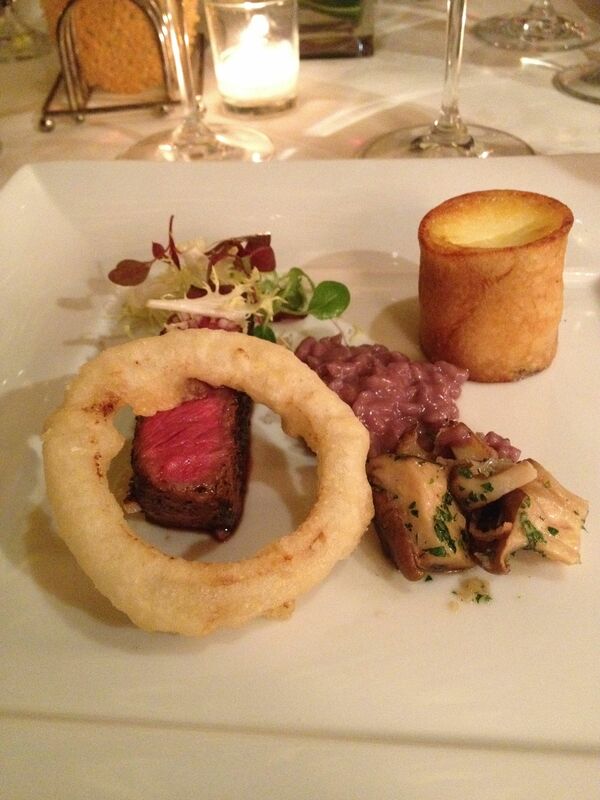 The top rated dish of the evening was next: Blackened Wagyu Rib Eye with Bone Marrow Custard and Red Wine Risotto. The beef had been blackened with pepper and espresso and was tender, marbled, and divine. Accompanying the dish was a 2005 Ladera, Howell Mountain, Cabernet Sauvignon from Napa Valley—a big bold red wine with lots of flavor. 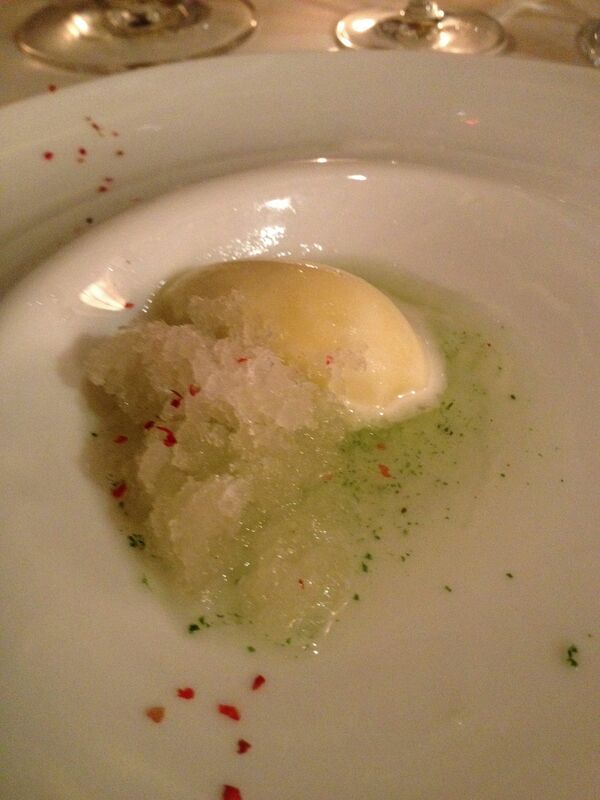 The pre-dessert (or, as the Inn calls it, the palate cleanser) was a Pineapple-Lemongrass Sorbet with Pink Peppercorn Granita. We eat at the Inn more often than we sometimes are willing to admit in public and have had many wonderful meals there over the years. This meal stood out even amongst all the other meals. It definitely deserves an A+.